HSBC says it "successfully defended" an attack on its online banking system but services were disrupted on a key day for many people's personal finances. 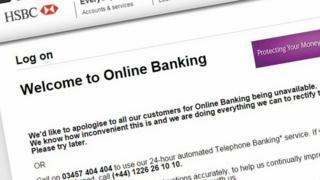 The bank is apologising to customers trying to login to its online banking which, for many, was unavailable. It said it was working with the authorities to "pursue the criminals responsible". "Where taxpayers need information from their HSBC account, and they are currently unable to access this they can include an estimate in their return in order to file by 31 January. They have 12 months from the date they file to amend this with the correct information," a spokesman for HMRC said. HSBC said that no customer details had been compromised by the attack and that it was "working closely with law enforcement authorities to pursue the criminals responsible". "HSBC internet banking came under a denial of service attack this morning, which affected personal banking websites in the UK," said a spokesman for the bank. "HSBC has successfully defended against the attack, and customer transactions were not affected. We are working hard to restore services, and normal service is now being resumed. We apologise for any inconvenience this incident may have caused." Victims of such attacks in the last month include the Irish National Lottery and the BBC. Banks are said to face these attacks on a daily basis, according to banking sources, and some of the High Street names have seen their websites affected. The upheaval on that occasion was blamed on "a complex technical issue within our systems" by the bank. More significant payment failures last summer at HSBC were this week revealed to have been the result of a backlog caused by a mega-payment sent to BACS - the system that processes electronic payments in the UK - exceeding the £1bn limit placed on the system. Wanda Reece, Montchevrier France: I receive my monthly private pension into my UK account and transfer it, online, into my French account. In "normal" circumstances it will be in my French account by the afternoon. Not today though. This has left me with no money in the bank to buy food for the weekend, and if it takes much longer, bills will not be paid either. Sujata Rath is still having problems: I've been trying to log in to my account since this morning but couldn't get through. Telephone lines are constantly on hold. When can I access my account?